This guide was introduced on January 21, 2013. This guide was last updated on July 5, 2017. Battledome Beta was opened for testing on October 26, 2012. Battledome Beta was opened to everyone on November 9, 2012. Aethia's Ability Academy was opened on Feb. 20, 2013. Please do not copy any significant portion of this guide and then claim it as your own. You have permission to copy any portion of this guide ONLY IF appropriate acknowledgement is given to neo__rainbow (two underscores) and/or to his neopet River_Mels_Song. Every effort has been given to make this guide as accurate as possible, but unintended errors and/or omissions may occur. Weapon stats may change without notice. Strategies listed in this guide may change without notice. If you notice any errors, or any omissions, please neomail neo__rainbow. Your help will be appreciated. This 1-Player Challenger Combat Guide is best suited for those Neopians who have a general knowledge of battling, and who want to battle relatively inexpensively or want to battle on a budget. This guide is not for 2-Player battling. This guide primarily outlines defence strategies. Even though strength and endurance (HP) stats are very important components in battling (and the more of both, the better), this guide tries to focus on defending against attack. For challengers who can freeze and/or disable weapons and/or steal items, a strategy based on defence may not be as effective as one based on strength or endurance. Since no overly expensive weapons are listed in this guide (i.e. Hidden Tower, Smugglers Cove, rarity 99, etc. ), the absolute best combat methods will differ from some of the methods that are listed in this guide. Some weapons in this guide need a minimum amount of intelligence to work for a given strategy. For example : Warriors Cloak Of Wit (need 400+ int) means that your pet must have at least 400 intelligence for the Warriors Cloak Of Wit to work properly in a given strategy. Reading books to your pet is one way to increase her/his intelligence. This guide does not have any strategies that integrate species specific weapons. Any suggested combat methods listed to defeat a challenger will be for Average toughness only. This guide is not planning to suggest any combat methods for Strong battling or for Mighty battling. All defensive (and dual) weapons listed in this guide have been chosen for the least defence that they are able to do. The best two defensive weapons (Best DW) for defence boosts (DB) are listed for each opponent. The Best DW are based on the highest percentage coverage of all attacks from weapons and abilities (not including reflection, freezing, stealing, draining, blocking, etc.). There may be more defensive weapons equal to (or argueably better than) the Best DW that are listed for a suggested combat method. All of the Best DW are suggestions for the use of one multi-use defensive weapon, and should be combined with a weapon and/or an ability that does some attack. The earliest full defence combination (if one exists) is listed for each opponent. There are likely more effective full defence combinations than those that are listed, when a higher pet defence boost is factored into your battling. All listed full defence combinations should work for any defence boost higher than what is listed. When there are more than one earliest full defence combination found, no more than three combinations will be listed in this guide. When there are more than three found, full defence combinations are first chosen by the attacking icons they can minimally do, then they are chosen by the least approximate cost in neopoints. Even if you use a suggested combat method for an earliest full defence combination, your pet may still suffer some damage (from reflection, freezing, stealing, draining, blocking, etc.). A listed full defence is not a guaranteed 100 percent invincibility. And if you use a suggested combat method for a full defence combination with less than the needed defence boost, your pet will likely suffer at least some damage. If possible, please do your own research before purchasing any battle items. If you find a better inexpensive defence strategy than what you find in this guide, please neomail neo__rainbow. from your inventory and choose the pet to bless. Visit Aethia's Ability Academy to trade faerie blessings for ability training. Only one ability per tier may be active at any one time. To switch abilities within a tier, the cost will be half of the original cost. Check out the Faerie Abilities Guide by _mariokart_ for more info. and adds it to your own. Most listed items should be easily found for less than 100,000 neopoints each. Note - Can only equip one. Downsize! (blocks 50% of attack) Note - Can only equip one. Note : All single use items can be used ONLY once, and then the item will disappear forever. Please note, as per the Beta News, IE8 is not supported in the new battledome. There is a daily limit of 1,500 neopoints and 15 prizes (which may include codestones, red codestones, weak bottled faeries, dubloons, neocola tokens, etc.). 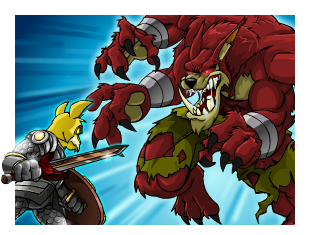 Until the daily limits are reached, some battles may earn you neopoints and/or prizes, some battles may not. A list of battledome prizes that may be earned can be found on the Jellyneo and on the SunnyNeo sites. These two sites are listed on the Neopets Community - Fan Site Directory, in the Recommended Fan Sites section. As always, please ask for your parent's permission before leaving the neopets site. Equip your pet with a Golden Sun Chalice and two multi-use attack weapons. Until your pet is fully healed, use the Golden Sun Chalice and one of the multi-use attack weapon for every round in the fight with Punchbag Bob. The Golden Sun Chalice takes an average of about ten rounds to heal your pet. After healing your pet, the Golden Sun Chalice will disappear for the rest of the battle. When your pet gets healed, use the two multi-use attack weapons for the remainder of the battle. Do not withdraw or your pet may not stay healed. This healing method requires that your pet has at least one available HP prior to the start of the battle. Since Punchbag Bob may take a very long time to defeat, this method is probably best suited for pets with a 250 SB or higher. Before trying this HP Recovery Strategy, remember to try healing your pet at the Healing Springs (every 30 minutes). * The Multiplier is the amount of increase of the challenger's weapon attack and defence icons. ** The Best Hits are rounded up, and do not include any reflected icons. Advisor Broos Hat does 7 icons of air attack, 5 icons of fire attack, and 5 icons of air defence. the Advisor Broos Hat produces 21 icons of air attack, 15 icons of fire attack, and 15 icons of air defence. Advisor Broos best hit is when he uses Advisor Broos Gnarled Staff with Advisor Broos Hat with the Static Cling ability. At average toughness (using multplier of X 3), the Best Hit is 93 icons (31 times 3). At strong toughness (using multplier of X 3.6), the Best Hit is 112 icons (31 times 3.6). At mighty toughness (using multplier of X 4.5), the Best Hit is 140 icons (31 times 4.5). Note - A faerie ability that does some attack should be added to the full defence combinations. Difficulty : 0 Use TWO multi-use attack Best Buyable Weapons PLUS an ability that does some attack. Defeat to obtain the 'Beating Punchbag Bob' trophy. Note - Can freeze opponent, and can reflect F and L.
Note - Can freeze opponent. Defeat to obtain the 'Kasuki Lu - Heeyah!' avatar. Note - Can freeze opponent, and has Lens Flare ability. Note - Has Lens Flare ability. Note - Can freeze opponent, and has Throw Pillows ability. No full defence combination found. Note - Can reflect L, and can permanently change your pet's gender. Note - Can freeze opponent, can reflect A, D, E, F, L, and W, and has Warlock's Rage ability. Note - Can freeze opponent (possibly multiple times). The Cosmic Dome is available to Premium members only. Note - Can freeze opponent, and can reflect L.
Note - Has Throw Pillows ability. Note - Can reflect A, D, E, F, L, and W, has Reflect ability, and has Tempest ability. and has Lens Flare and Tempest abilities. Note - Can reflect W, has Drain Life and Reflect and Tempest abilities. and can steal an item (possibly multiple times). Note - Can freeze opponent, and has Drain Life and Snowager's Breath abilities. Note - Has Reflect and Snowager's Breath abilities. Note - Can steal an item (possibly multiple times), and has Lens Flare ability. Defeat to obtain the 'Space Faerie' avatar. Note - Can reflect L.
Defeat to obtain the 'Ghost Lupe' avatar. to obtain either the 'Heermeedjet' or the 'Meerouladen' avatars. Note - Has Tempest ability. and has Throw Pillows and Tempest abilities. Note - Can steal an item (possibly multiple times), and can freeze opponent. Note - Can drain 4 to 32 HP from opponent, and has Lens Flare ability. Defeat to obtain the 'Meuka - Snotty' avatar. Note - Can freeze opponent (possibly multiple times), and has Throw Pillows ability. Defeat to obtain the 'Black Pteri' avatar. Note - Can reflect A, D, E, F, L, and W, and has Throw Pillows and Tempest abilities. Note - Has Drain Life, Throw Pillows, and Warlock's Rage abilities. One of the ways to obtain the 'Hello, little Lupe... BOOOM!' avatar is to lose to Balthazar. Note - Has Lens Flare and Warlock's Rage abilities. Note - Can reflect L, and has Lens Flare ability. Note - Has Throw Pillows and Tempest abilities. Note - Can freeze opponent, can reflect D, E, and L, and has Throw Pillows and Warlock's Rage abilities. Note - Can reflect F, and has Throw Pillows and Snowager's Breath abilities. Note - Can freeze opponent, and can reflect A and D.
Note - Can freeze opponent, and has Warlock's Rage ability. Note - Can freeze opponent, and has Lens Flare and Tempest abilities. Note - Can steal an item (possibly multiple times). Note - Can freeze opponent, can reflect A, D, E, F, L, and W, and has Snowager's Breath ability. Note - Can steal an item. Note - Can steal an item, and has Throw Pillows ability. Note - Can freeze opponent, can steal an item, and has Lens Flare and Tempest abilities. The following coding is 563 characters long.